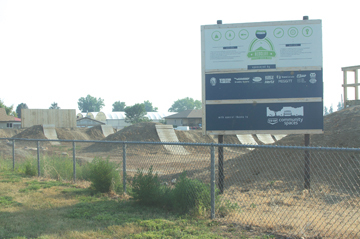 The Redcliff Mountain Bike Skills Park has been in the works for four years and now the last phase is expected to be completed by the fall. Landscaping and the installation of wooden ramps make up the last pieces of the park next to the Rec Tangle Arena. The last phase was made possible after a grant of $36,000 was received from the South Country Co-op Community Enhancement Program to start the construction of the wooden ramps, grading, fitting out a proper drainage system and irrigation for the landscaping. “The Town of Redcliff is in there right now putting hydrants in and they’re going to be seeding it right away with some natural native grasses,” said Kurtis Peters, president of the 670 Collective Mountain Bike Club and founder of the new bike park. The initial phase included wiping the area out and piled the dirt in different spots to get an idea of what the park was going to look like and started building basic jumps, he added. For the second phase, the park got a grant from the Community Facility Enhancement Program for $9,000 and went towards the cross country skills loop around the park. “We’ve been rebuilding things as we go,” said Peters. He added there might be a bike competition in the future, but in the meantime will serve the immediate region.